Many will know the Soviet Republic as a place where time just stood still, even on this day you will notice that you get into this 1970s – 1980s time capsule. 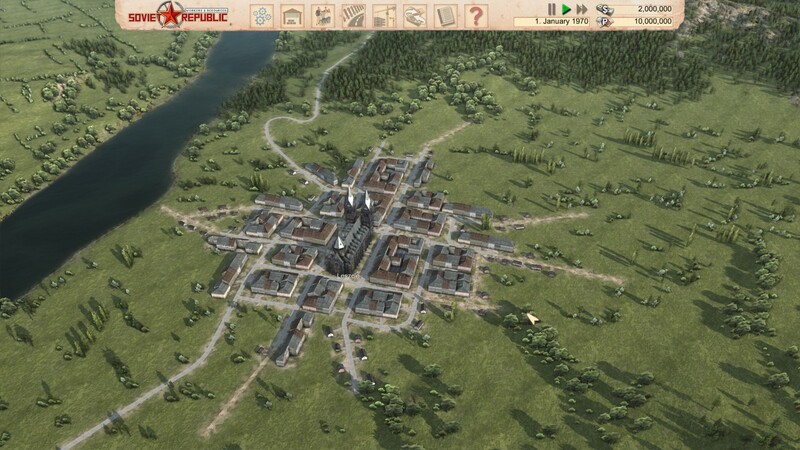 With city building games such as SimCity and City Skylines typically are set in a modern-day metropolitan environment, some might want to play this kind of game in a different setting without going back to the middle-ages. 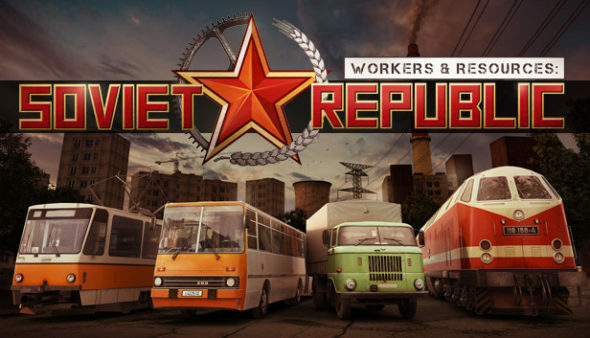 Here comes Workers & Resources: Soviet Republic, the game that will take you back to the 1960s Russian countryside. Workers & Resources: Soviet Republic doesn’t really come packed with a story at this moment, limiting you to be the God of the inhabitants that roam the sandbox. You can decide to alter a few settings and play in a different time period or manage an already inhabited country. The game takes place in a border country that is stuck between USSR ground and American-owned land, which is explained later in the gameplay section. Since there is neither story nor flow, there isn’t anything that is keeping you in place, you simply set up a game and work out different scenarios for yourself. It would have been nice to have had a few campaigns already available, but that will be something for the full release. The game looks periodically correct, as the Eastern Bloc consisted mainly of dirt roads and forests. The buildings and cars all respect the period in which the game is set, and the overall feel of the game is just charismatic. You are not building a huge metropolitan city like in those other games; no, you are making a cozy back road village instead. You can adjust the graphics from absolute 1980s to fairly decent. Don’t expect high resolution 4K textures since it’s a very large map, but the game does look pretty ok on the high settings. Further improvements are expected when the game will hit the shelves in a few years. To get you fully immersed into the Soviet days, music plays a huge role. The songs that are played in this game are Soviet-inspired titles, from classical opera to some more ‘modern’ iterations. It’s amazing how a game can become fun instantly because the soundtrack is perfectly on point. If you are a fan of the Russian culture, you will enjoy running your communist village with the melody of the great USSR playing on the background. Next to the music, there are decent sound effects, just like you would expect. You hear the interaction of the industry, the people and everything moving around, but you will probably enjoy the music the most. Workers & Resources: Soviet Republic is a building game that simulates having an old Eastern Bloc community. In this city builder you must manage everything from resources to the well-being of your inhabitants. When starting the game, you can adjust a few options to make the experience easier or more realistic. Sadly, there is only one mode and one main map, but you can choose to have it fully empty or have an already inhabited location. Next, there are difficulty options, which can be fully adjusted to your needs and skills, set rules for education and necessities. One of the more interesting options you can choose is the starting year (1960 – 1970 or 1980). This influences the available buildings, vehicles and overall well-being of the country. Now that you are ready to start, you just get dropped into the game, no instructions, nothing. This is probably done so players can test out the main mechanics in Early Access and the developers will later on include a detailed tutorial mode to get you started, as happens to be the case with more and more games these days. Your career of city builder starts on this piece of land situated between the Russian and American owned countries. This information is crucial because you will be dealing with two currencies: Ruble and Dollars. You can get money by selling merchandise to the respective faction and some items will be cheaper depending on the currency you’re using. A blooming country needs two main ingredients: inhabitants and utilities. 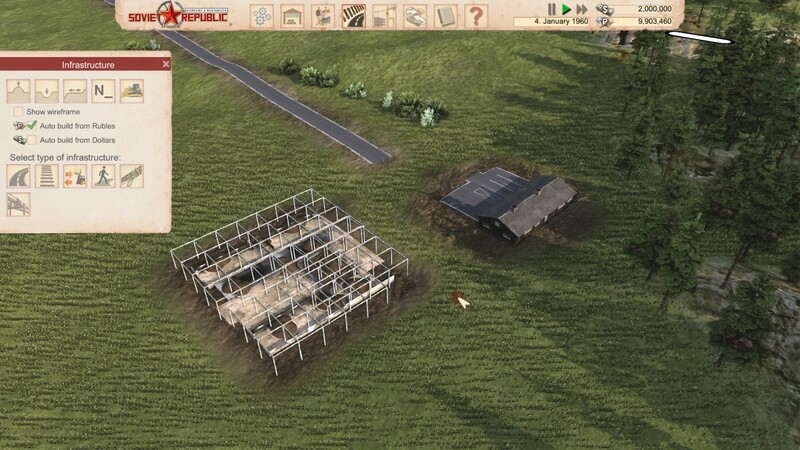 Prepare to build everything needed to keep the town running; from workplaces to stores, educational systems and housing units. The stores need to be supplied by factories, which in turn need to be supplied by a whole chain of resources. Having good management skills is crucial to keep the game going. You will have to buy vehicles for factories to gather the necessary items and to distribute everything, roads need to be paved. The game controls quite fluently and although it takes a bit of time and effort to get used to everything in the beginning, you will easily find your way around the many menus present in this title. 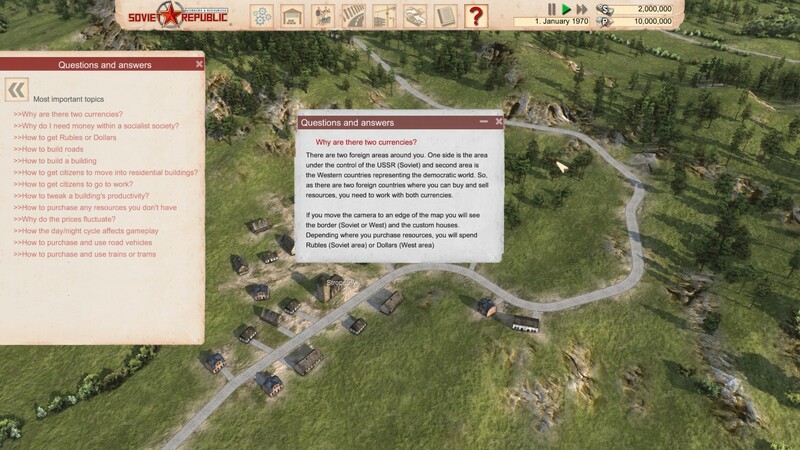 If you want to know how it was to build a town in the Soviet regime from 1960 until 1980, this game might be something for you. It’s recommended that you have some experience building and managing cities as you just get dropped in the game without a real goal. Things to look out for the final release will be a campaign mode and a good tutorial to get you started. For the moment it’s up to you and your fantasy to keep on going, creating a great place to live in.